If you have problems viewing or accessing areas of the website, please contact the webmaster. When you do so, please also let him know what computer operating system you are using (i.e., Windows XP, Mac OsX, Windows 7, Linux, etc. ), and what web browser you are using (i.e, Internet Explorer, Firefox, Safari, Chrome, Opera, etc. ), because both of those can influence what you see. In particular, Microsoft's Internet Explorer has many idiosyncrasies which make it behave differently from most other browsers. I've made a purchase, but haven't received a download link? I see a message that the music player isn't available? Adobe Flash isn't available for my device? There are some platforms that Flash doesn't support. Most tablets and mobile devices, for example, don't have it available. In those cases, you can download the clips to your device and play them there. How do I download a sample? In most browsers, simply right-click on one of the sample buttons. A menu should pop up, showing various things that you can do at that point. One of the items on the menu should be "Save Link As" (in Firefox), "Save Target As (in Internet Explorer), or something similar. When you click that item, you'll get a dialog box that allows you to specify where on your computer to save the file. On a mobile device (such as a tablet or phone), holding your finger on the sample button will be treated similarly to a right-click � that is, you'll get a menu of options. 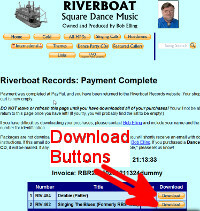 Look for the option to save or download the link's target file. The Cuesheet sample button opens a blank window? Our cuesheets are saved in Adobe's Portable Document Format (PDF), and you'll need either the Adobe Reader or a similar program to view them. When you install Adobe Reader (and most of the other alternatives), it will install a plugin into each web browser on your computer that will allow you to view a PDF file right in the browser itself. Our website takes advantage of that to open up a pop-up window with the PDF cuesheet inside it. But, if you don't have Adobe Reader (or one of its alternatives) installed, that won't work. If a PDF plugin is not available for your browser, you can download the cuesheet (using the same method as downloading the music clips, above) and view the downloaded file on your device with a PDF reader. What tools were used to create this website? Used for modifying and manipulating bitmap graphics. Except for PSPad (which is freeware), all of these are open-source software projects. A few minor custom-written programs were also used.